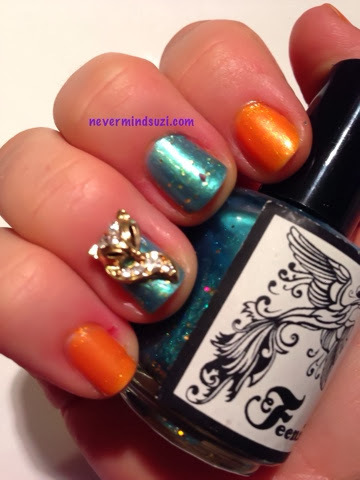 Lately I've become a huge fan of 3D nail decals, especially metal ones. And Born Pretty Store is one of the best places to get a wide variety of them including these gorgeous foxes which I recently purchased here. As I was wearing fox charms it was only fitting to wear my favourite fox print dress and I matched my nails to the dress. 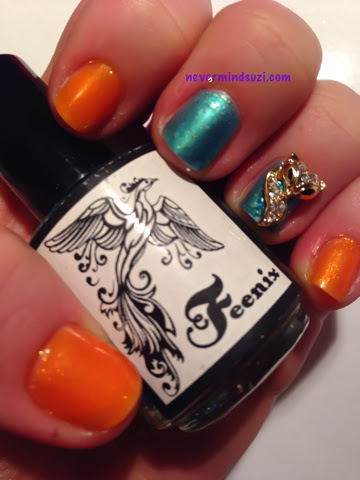 Feenix - Waikiki Sunset is a metallic green beauty I got in a grab bag from Debbie Crumpet. I used 3 thin coats to build up the colour and there are beautiful golden glitters sparkling through it too. Sinful Colors - Cloud 9 is another Poundland bargain. I'm not a huge orange fan but this is so pretty, it's so sparkly and shimmery. This was also 3 coats. 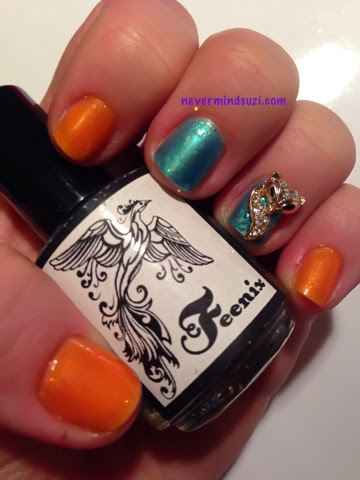 I stuck the fox charms on with a clear polish and they lasted most of the day (one caught on my coat) until I was changing my mani. This mani was very distracting and kept me occupied whilst stuck in a boring course.